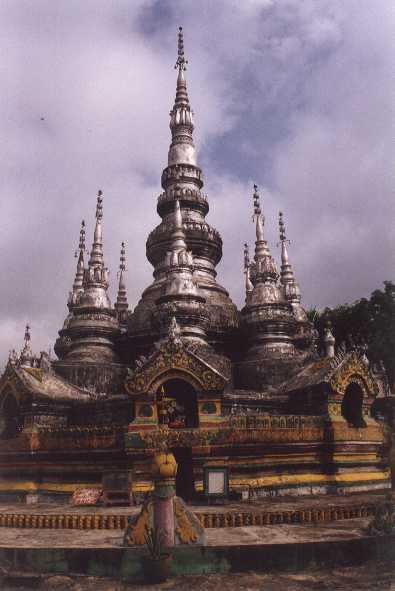 Manfeilong Pagoda is in Damenglong village which is 70 kilometres south of Jinghong and only a few kilometres from the Sino-Burma border. The silver pagoda was built in 1204 in honor of a footprint said to be left by Sakyamuni himself during his visit in the area. The pagoda actually consists of 9 stupas, with the primary stupa in the centre while the other 8 smaller stupas clustering to its base. The primary stupa rises 55 feet. Bells hung on the stupas give wonderful tinkles in the breezes. Below one of the stupas and in a niche the Buddha's footprint is enshrined.